Facts about Welsummer chickens. Welsummers chickens originated from Holland and is named after a village there called Welsum. This is the breed that is made out of Rhode Island, Barnvelder, Patridge Leghorn, Patridge Wyandotte as well as Patridge cochin. This hen was imported to Britain in the year of 1928 because of the brown eggs that are larger in size. American Poultry Association did add the Welsummer chicken in its Standard of Perfection in 1991. Welsummer chickens fall into the light breed category, even when it has got a body of good size and also weight. They an attractive chicken and are a must have to include in your poultry collection. When someone says the word “rooster,” you probably picture a Welsummer. The Welsummer is the rooster on the Kellog’s Cornflakes box. The Welsummer chickenis upright and alert in nature. This hen has got a body which is well built and the breasts are well rounded. The wings of the Welsummer chicken are longer and have got fuller and larger in nature. The head of the breed is symmetrical and is fine with the comb that is single and a smooth face. The neck of the breed is longer in size and is abundant in hackle. The legs of the Welsummer chicken are medium in the length and have got no feathers on them. The plumage of the hen is waxy, silky and tight in nature. There are chances for the Welsummer chicken to have abdomen that is silky and is free from the bagginess that is found in most of the thighs. The head of the Welsummer chicken have got copper or golden brown color. The breast of the Welsummer chicken breed is reddish brown in color and the feather is stippled in nature with the black specks. The tail of the Welsummer chicken breed is black in color with the outer feathers that has got brown. 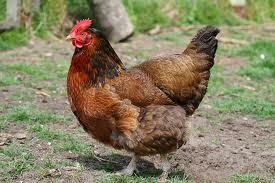 This is the breed that is popular for the dark brown colored eggs and it can lay about 160 eggs in every year. Welsummer chickens are intelligent, friendly, but not very docile. They are very active and are one of the best free range chickens for foraging. The average size of the Welsummer chicken is 6 to 7 pounds (2.7 to 3.1 cm). Welsummer chickens can be sexed upon hatching from the egg. This is because they are obvious differences between males and females chicks. The female Welsummer chicken have have dark lines around their eyes. Males have the same line but the line is not a profound and is blurry. The females also have a distinct triangle marking on their heads and the males have a less profound triangle marking.